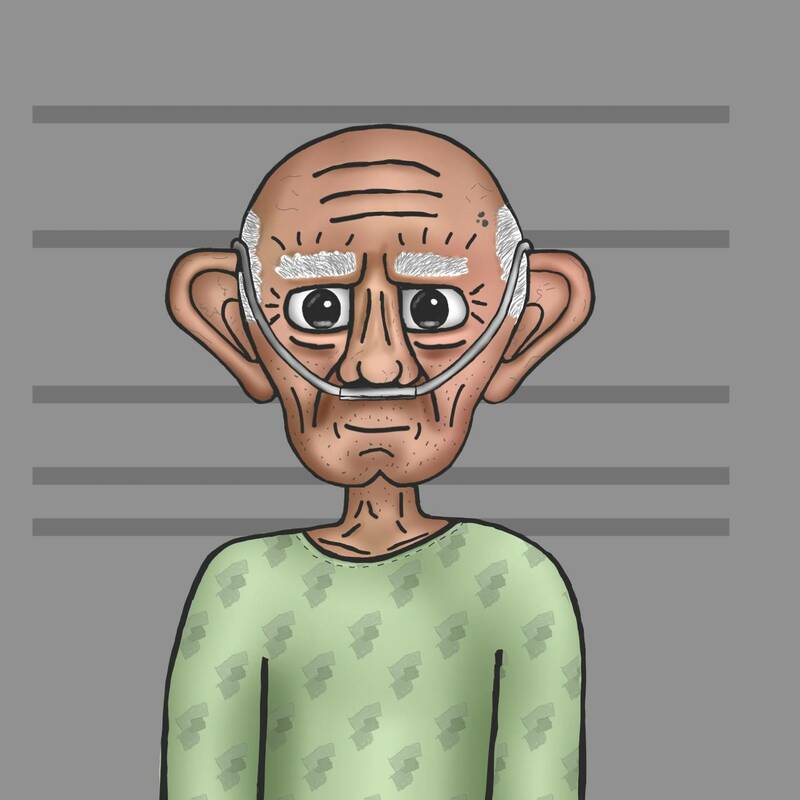 Now I shaded the two line drawings of the Old Man, to give him a three dimensional shape. As you might notice straight away, this is my first image in color! I gave him temporary colors since I felt like the image didn't look quite right in just black and white. For the Robot, this was not an issue, since he will be mostly white and grey in the final version as well. But here, especially with the skin, it was hard to imagine what it would really look like without any color. However, the colors are only temporary. Later on I will work on a cohesive color palette for the entire film, and then this will be redone to fit everything else. But for now, I think this properly shows kind of what I have in mind. So what has happened besides the color? Well firstly, I added some beard. This is something I have wanted all along but it was best to add such fine detail in the last step rather than easlier. I also added some spots and visible veins. I won't be going overboard with this since I don't want it to be too realistic. The more precise amount and location of these "skin" details will be decided while painting the finished model, but this will at least give an idea of what I am going for. I also inverted the color of the hair to be white, giving him the look of an older man. I kept it black in the older image because I painted everything in a black against a white background, but now I could give it the white/grey color I intended. Here is a close up of the face so it all can be seen more clearly. As for the skin color, he is most likely quite a bit more tanned than he will be in the film. I want him to look pale and sick in the finished film, so it will most likely be toned down, at least a bit. I have yet to decide what eye color he will have, since I am not really sure what I want the eyes to look like at all, detail-wise. I have painted the eyes completely black, without any irises, but the finished model will most likely have them. Another detail saved for when I make the 3D-model I guess. Here is a short time lapse I recorded of the painting of the side view. It took surprisingly little time to paint, since I had learned quite well how to do it by painting the front view. The painting process is presented in a bit slower speed this time compared to the Robot timelapse. The number of images are the same, they are just shown for a longer period of time, hopefully making it easier to see what happens. However, I am drawing faster this time because I have gotten better at it. Next time, I think I will double the amount of pictures grabbed (grabbing a frame every second instead of every other second as it is now) so it is becomes a bit easier to see what I am actually doing. Things are flying around quite a bit right now, but I hope it will be a bit useful anyways. 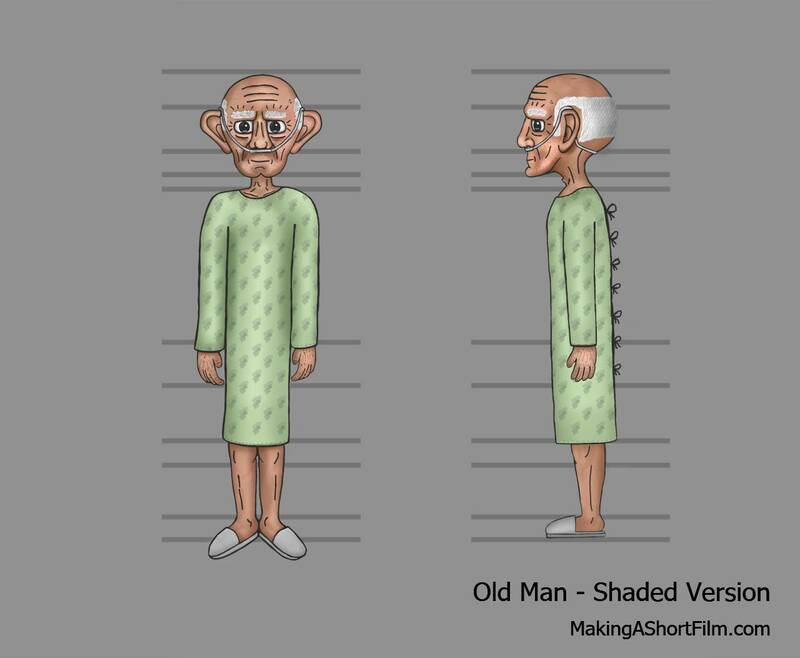 This concludes the concept art design of the Old Man. Now I will move on to designing the Doctor, the last of the three main characters. And it is also the one I have the least idea of what I want it to look like, so I will just have to try to experiment and see if I can come up with something I like. See you then! Lastly, I would just like to say thank you to loziomario for becoming a Silver contributor! Thank you so much for supporting the short film! Super impressed! I really didn't think he would end up this good when I saw the first sketch. No offence at all intended! I like his kind look, and I truly admire that you, in just a sketch, managed to make him look both sick and healthy at the same time. A bit like he is a young soul trapped in an old mans body. That also with a spark of longing in his eyes. I look forward to seeing the robot and the old man together. I sense good dynamics there. Looking forward to see it all in motion!! Very well put that he is a young soul trapped in the old man's body! I want him to feel like he is not done, at all, and that he is just the same person he always was, just now with a worse transportation device (body).